Here’s a fact that every business traveler, public transit commuter, or office worker is woefully aware of: The outside world is loud and full of distractions. Thankfully, noise-cancellation technology has been steadily developing over the last few years, with hundreds of headphones designed to eliminate the sounds you don’t want to hear occupying store shelves around the globe. Thanks to advancements in wireless technology — and the demand for fewer wires from those who own jack-less cell phones — the best new noise-canceling headphones are most often also wireless these days. But never fear, wire lovers: Many of the headphones on this list are dual threats, allowing you to plug in and save some battery, or unplug and let the good times roll. Our list detailing the best noise cancelers in any style will help you cut through the noise in more ways than one. Why you should buy them: Top-tier sound, plush comfort, and (of course) impressive noise-canceling make Sony’s WH-1000xM3 the headphones to beat. Who they’re for: Those who are looking for total sonic isolation, but don’t want to give up high fidelity sound to get it. Sony makes some absolutely incredible noise-canceling headphones. In the last iteration of this article, Sony’s MDR-1000x earned the top spot (and a 5/5 rating in our official review) thanks to an unbeatable blend of comfort, control, and audio quality — not to mention the fact that they isolate sound as well as any cans we’ve used. They weren’t just our favorite noise-canceling headphones — they were our favorite headphones, full stop. This time around, we’ve decided to elevate another pair of Sony phones to the apex of our list — the WH-1000xM3, which actually improve upon the MDR-1000x in many ways and even cost less upon release. Underneath ultrasoft leatherette earcups, the WH-1000xM3 pack in dual 40mm dynamic drivers that bring both movies and music to life with stunning, warm detail. The headphones offer excellent instrumental separation, with powerful bass response matched by precise performance in the mid and upper registers. Who’s it for: Those looking for a great-sounding, feature-packed, pair of noise-canceling headphones at a fraction of the cost of industry leaders. With 30 hours of battery life, active noise cancellation, and a simple and understated design that’s geared towards business trips and long commutes, TaoTronics’ TT-BH060 are the low-budget champion of the noise-canceling headphone market. Where many other models cost many multiples the price, this plucky TaoTronics model costs less than a single night out on the town. The hyper-affordable headphones come inside a woven hard case with an included 3.5mm cable for wired listening, and easy-to-use controls make it quick and easy to change songs, adjust volume, and turn off and on the active noise cancellation. One thing that’s worth noting is that you’ll want to make sure you turn the noise-canceling off when you’re not wearing the headphones — the power to the noise-canceling doesn’t turn off when the headphones themselves are powered off. The sound is warm and balanced, with the headphones offering tight and energetic bass performance, but not overwhelming with the same muddy layering in the midrange we hear in many headphones that cost so little. The well-balanced sound is benefited greatly by the active noise cancellation, which provides a blank slate over which the TT-BH060 can project your favorite sounds. If you’re in the market for a great pair of noise-canceling over-ear headphones, but you don’t want to spend the hundreds of dollars it costs to get industry-leading models from Sony and Bose, these are probably just what you’re looking for. Why you should buy these: You’re looking for the best noise-canceling tech that money can by. Who they’re for: People who frequently listen to music on airplanes, trains, or in other noisy settings. When it comes to noise-canceling technology, the Quiet Comfort line from Bose has long been the industry leader in both comfort and silence. The company’s current flagship, the QC35 II, is no exception on either of those fronts. The QC35 II are essentially the same headphones as the original QC35 model, except with a button to activate Google Assistant or Siri control (or adjust noise-cancellation levels). Light and extremely well-padded, the QC35 II will remain comfortable even when they spend the whole day on your head. They’re also even more understated than their nearest rival, the Sony WH-1000xM2 (see above), with a jet-black appearance and a slimmer overall profile. The noise-canceling itself also bests Sony’s cans by a tad, with the longtime industry leader showing exactly how it made it to the top of the pile in the first place. Overall sound quality is extremely high with the QC35s, though they do offer the same boosted-bass signature that Bose has prided itself on for a generation — something that has proven divisive among audiophiles. That said, those looking for a high-performing pair of wireless on-ear headphones will find what they are looking for in the Bose QC35s, and take comfort in the fact that the brand has long been considered the industry standard in the genre. Why you should buy them: In terms of features, comfort, and sound quality for the money, the Plantronics Backbeat Pro 2 headphones are the best you’ll find. Who they’re for: Those who want noise-canceling, great battery life, and solid sound, but don’t want to break the bank to get it. It’s hard to find an affordable pair of wireless on-ear headphones with quality active noise-canceling, which is what makes the Plantronics Backbeat Pro 2 so special. Along with their impressive noise-canceling, the Backbeat Pro 2 also throw in quality sound, sleek looks, and the best cost-to-features ratio you’ll find on the market. Rarely affordable features like pressure-sensitive earcups — which pause the music when you remove the headphones — come standard, as does a class-leading wireless range of 100 feet and an impressive 24 hours of playback time per battery charge. As expected from a company known for wireless headsets, call quality via the built-in mics is excellent, and solid padding makes the Backbeat Pro 2 comfortable for hours of listening. Like the Sony MDR-1000x, the noise-canceling tech employs two microphones for better cancellation and offers multiple levels of ambient awareness so you can allow airport announcements or other important ambient sounds to sneak through. And while the Plantronics don’t quite offer the same whisper-quiet noise-cancellation as the Bose QC35 or Sony MDR-1000x, they do offer a solid amount of noise reduction at almost half the price. Overall audio quality is also impressive for the money, including clean mids and highs, and a slightly restrained low end. Those looking for the most headphone for the money will find a friend in the Backbeat Pro 2, a feature-packed pair of cans that do more than many pricier alternatives. Why you should buy them: Impressive noise cancellation, luxurious comfort, and exquisitely warm and present sound make the Sennheiser PXC 550 a great choice. Who they’re for: The business traveler who wants to shut out the world, but doesn’t want to give up great sound or everlasting comfort. Long revered as one of the best producers of high-end headphones, Sennheiser has been slowly upping the quality of its active noise-cancellation technology to compete with Bose in recent years, and the PXC 550 are the closest the company has ever come to its rival. Similar in many ways to the Sony MDR-1000xM2, Sennheiser’s PXC 550 offer a myriad of great features — ambient awareness, touch controls, and a sleek, businesslike exterior. But, also like the MDR-1000xM2, the best reason to check them out is the sound quality. Rich, balanced bass meets warm and detailed mids, with a clean upper register completing a perfectly spiced dish of sound. Few brands craft sound profiles as well as Sennheiser, and the brand’s sonic muscles are well-flexed for the excellent-sounding PXC 550. These are also among the most comfortable headphones we have tested, with thick earpads and a lightweight design that makes them virtually unnoticeable even after hours of wear. While the MDR-1000xM2 do slightly edge out the PXC 550 for our top slot in the genre, the two pairs of headphones are extremely competitive. Both offer slightly different designs and sound signatures, but share extremely similar usability and comfort, making it worth a head-to-head comparison before you pull the trigger on one or the other. Why you should buy them: Solid noise-canceling and an extremely customizable sound profile that can tackle any genre with ease. Who they’re for: Those who listen to an extremely varied array of music in multiple locations, and want cans that can shape-shift with their daily tastes. JBL‘s most technologically advanced headphones ever, the Everest Elite 700 use an app to allow listeners to customize their sound profile at any given moment. The app allows the headphones to calibrate the sound signature and noise-canceling to your specific head shape, as well as let you choose between various levels of ambient awareness. But the real pièce de résistance is a customizable 10-band EQ, which makes it possible to adjust the sound signature for any genre of music you desire at a moment’s notice. Even without adjusted equalization, the Everest Elite 700 show off a well-balanced sound signature, but with a little tinkering, they’ll fit any style of music — from death metal to classical — like a glove. Comfort is also impressive, with sculpted earcups that provide even pressure around your ears. Though the noise canceling itself isn’t quite as high quality as pricier competitors, the Everest Elite 700 create a clean slate that allows your music to shine. If you’re looking to swap styles often, or have a particular EQ profile that you can’t live without, these are the cans for you. Why you should buy them: You want noise-cancellation to help create a blank canvas for excellent sound, rather than to drown out the world. Who they’re for: The discerning listener who is willing to compromise a bit on noise-cancellation in favor of great looks and superior sound. 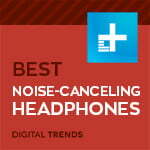 We’ll be the first to admit that Sennheiser’s NoiseGard noise-cancellation used in the Momentum 2.0 doesn’t reach the same level as others on this list in terms of sheer ability to silence the world. And while it will definitely help you drown out distractions on a noisy flight, the feature is best for helping to melt away ambient annoyances while you’re deep in the music, creating a sort of calming serenity. Beautifully designed for serious listeners, the Momentum 2.0 Wireless are a high-class pair of headphones for those who absolutely will not compromise on sound. The audio feature of envy on the Momentum Wireless is the headphones’ exceptional talent for dimensionality. They create an expansive soundstage, broadly spreading out musical instrumentation throughout spherical space. And unlike many wireless headsets, there’s no audible amplifier noise to speak of here, allowing the cans to expose stark clarity in their silence. If your musical happy place isn’t consistently a plane, train, or automobile, but an office or study, these are the noise-canceling headphones for you. Why you should buy them: You want the best noise-cancellation on the market for the money. Who they’re for: Those looking for excellent noise-cancellation, but who don’t care about cutting the cord. Taking the place of a legend is never easy, and with 30 odd years of pioneering research behind it, Bose’s QC15 was just that. So, it was no small feat that the QC25 replaced the old timer with upgraded noise-canceling tech, better audio chops, and more style to boot. Bose’s wired flagship takes this slot for good reason. After all, most of us probably don’t need a wireless connection, and forgoing that near-standard option these days can save you some real green. The QC25 is full of a similar array of Bose’s famed noise killers as it’s pricier sibling, the QC35. Both offer an emphasis on low-frequency cancellation, thanks to microphones both inside and outside the well-padded earcups. Of course, you still won’t be able to kill every sonic nuisance around you, but Bose gets closer than anybody else and does so with a relatively clean sound signature. You also get solid battery life for an excellent overall package at a relative bargain. Why you should buy them: They offer surprisingly excellent noise-cancellation in a compact, budget-friendly package — oh, and they’re earbuds. Who they’re for: Those who prefer in-ear headphones to on-ear or over-ear options. Not everyone likes to rock massive over-ear headphones, especially while commuting. Phiaton’s BT 150 NC offer a simple solution, providing legitimately good noise-cancellation in a pair of neckband-style wireless earbuds. Even while listening in busy office environments or on the 5 p.m. train after work, ambient noise seemed to disappear completely, allowing our favorite music to stand out. The NC’s 12mm drivers boast surprisingly strong performance considering their size, though the buds’ active noise-canceling technology does somewhat muffle response from the upper register. The BT 150 NC also feature some neat tricks — remove one earbud, for example, and the headphones’ accelerometer will trigger, automatically shutting off the noise cancellation. Touch controls on the neckband make navigation a breeze, and the headphones come complete with a proprietary cable so you can switch over to wired listening should the battery give out. Can you find better noise-cancellation in a pair of earbuds? Maybe — Bose’s QC20i ANC have an argument. But you just can’t beat the value of Phiaton’s offering. We test headphones the way normal people live.